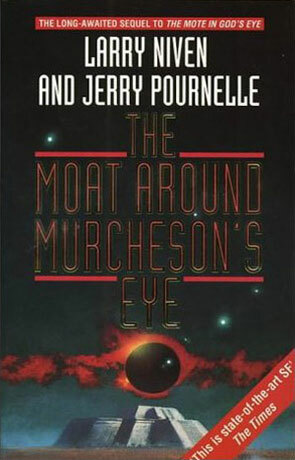 The Moat around Murcheson's eye is the sequel to the scifi classic The Mote in God's eye by Larry Niven and Jerry Pournelle. The Gripping Hand is the sequel to The Mote In God's Eye and as that I think that it's utterly uninteresting for people that haven't read The Mote (if you haven't read The Mote, but intent to, do not read the rest of this review - it will not hold anything of interest for you and could possibly spoil some of it for you), but if you have read The Mote and wants to know what happens when the Moties gets a chance to leave their system and the humans goes back to the Motie system to stop them, you have to get and read this book! In some ways I found The Gripping Hand book a lot better than The Mote - first of all we get spared the military bullsh*t and secondly I found it better written and better paced. I did miss the freshness of the Moti aliens that was so interesting in The Mote, but I can't see how that can be helped. All in all a surprisingly good sequel.